(AP) Democrats from around the country cheered last year when a bumper crop of new candidates in Virginia surpassed all expectations, winning 15 seats previously held by Republicans in the Virginia House of Delegates. Powered largely by voter dislike of President Donald Trump, the new class' success presented a potential model for how Democrats could make similar gains in Congress and statehouses around the country in this year's midterm elections. Many of the newly elected were new to politics, and as a group they brought a sweeping new diversity to Virginia's legislature. But the thrill of victory in Virginia has given way to frustration, as new lawmakers have had little success advancing their legislation. Republicans, thanks in part to winning a random drawing to decide one tied race, kept control of the state House and have been largely unreceptive to the new Democratic lawmakers' efforts at getting their campaign promises turned into law. It's an outcome that could play out around the country next year, particularly in more Republican-leaning states. If Virginia's wave election is a preview of the midterms, this year's legislative session could highlight the practical limits of Democratic gains. "It's been tough. 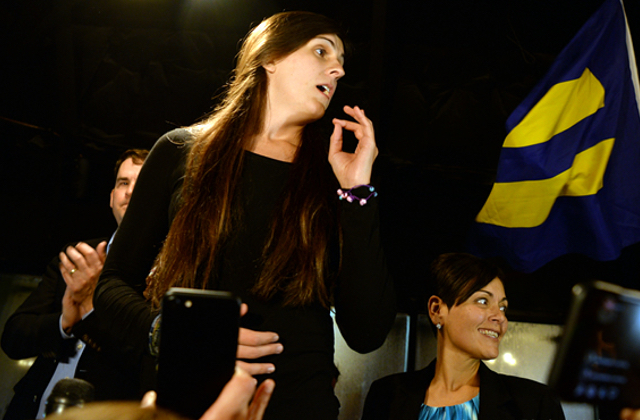 It's certainly a learning experience," said Danica Roem, the nation's first openly transgender person elected and seated in a state legislature. After she won last year, she received a congratulatory call from former Vice President Joe Biden, an invite to accompany singer Demi Lovato at the American Music Awards and worldwide attention. But her welcome to the House, which Republicans control 51-49, has been more subdued. All 14 pieces of legislation she's sponsored have already been killed. That's a familiar refrain among the new Democratic lawmakers, who have also seen most if not all of their legislation die. The new lawmakers say they weren't expecting Republicans to embrace all of their ideas, but say they're puzzled that noncontroversial ideas are dying on strict party-line committee votes. "I was expecting a lot of partisanship, I wasn't expecting quite that much," said Del. Lee Carter, an outspoken member of the Democratic Socialists of America whose defeat of a longtime incumbent was among the most surprising Democratic wins last year. "They're trying to keep me in my place as a freshman," said Del. Debra Rodman, who defeated a longtime incumbent who was popular in the GOP caucus. Republican House Majority Leader Todd Gilbert said it's nothing personal, it's just how things have always been with freshmen in both parties. He said it takes time for lawmakers to learn how the legislative process works, and how to build relationships with other lawmakers to get things passed. "People come in here with a ton of bright ideas that they think are a magical fix to whatever issue concerns them," he said. "You don't just get to come in and dictate to everybody else how the world works and what public policy looks like." Carolyn Fiddler, a longtime Democratic operative focused on state legislatures who works at the liberal blog Daily Kos, said Democratic candidates running for statehouses around the country won't be put off by the lack of legislative success by new delegates in Virginia. She said few candidates are running on one or two specific issues, but instead have broader motivations. "They're running to have their constituents' voices heard," she said. And in Virginia, the new Democrats are still having some impact even without getting their bills passed. On Monday, House Democrats and some Republicans were able to force changes on legislation to rewrite electric utility regulation against the wishes of Dominion Energy, the state's most politically influential company. Several new Democratic lawmakers campaigned on limiting Dominion's influence and the vote almost certainly would have gone the other way a year ago. The chamber has also been reshaped in part by a sharp increase in the number of women among its ranks. Of the 19 new delegates sworn in in January, 12 are women, all but one of those Democrats. The increase is part of a national surge in women seeking office in the Trump era. Del. Kathy Tran, a freshman Democrat and mother of four who has breastfed her youngest daughter on the House floor, said the influx of women has meant a greater visibility for women's issues. "It's hard to ignore us," she said. It has also meant that people are speaking out on issues they would have stayed silent on before - workplace sexual harassment, for example, said Del. Vivian Watts, the longest-serving woman in the House. "Obviously we have a ways to go, but the voice has been heard in a way that it hasn't been heard before," said Watts.